This collection is absolutely beautiful! I have it in my guest bathroom along with the Criscill Penelope towels and paired it with pale yellow bath rugs. You will not be disappointed. 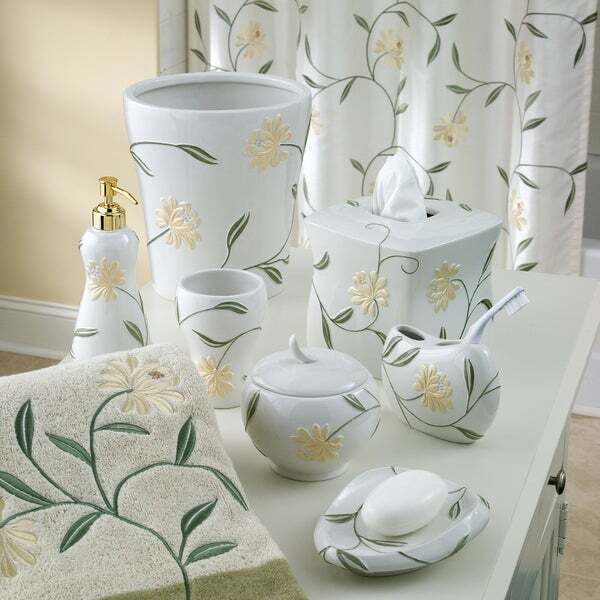 Transform your bathroom with the Penelope Bath Collection featuring organically curved white porcelain bath accessories. Adorned with delicately embossed floral stems, they are hand painted in rich pearlised pigments. OMGGGG! This bathroom collection is GORGEOUS. I recently renovated my bathroom and wanted to get new accessories and I came across this collection. The pictures doesn’t do any justice. Not only are these items beautiful they are made really well! I am happy with my purchase! I just love the whole collection. We are remodeling our bathroom and this collection matches perfect. The shower curtain hooks are so cute they look like the flowers on the shower curtain. I don't feel like this is the best quality and the holes in the piece are weird - what are you supposed to put in the larger hole v. the smaller one? It seems like it would tip over and be awkward. I want to send it back, but the return shipping is nearly as much as the cost of the product. The colors are pretty bland - I'm not impressed. I bought the waste basket from this collection. I love it so much I am going to buy the whole set. It has a very contemporary and stylish feel to it and makes my bathroom stand out from the rest of the house. It was very easy to design around and makes my bathroom feel very luxurious. I have had several compliments on it too. I’m very happy! These are elegant, functional and work beautifully in my dove grey and pale yellow guest bath! Beautiful collection. It really has enhanced my bathroom very nicely. I returned this item not because there was anything wrong with the product. I had purchased it for a gift and found out that this pattern had been purchased and this would have been a duplicate. I choose this product because it matched my floors and reminded me of the freshness of spring. "Is the flower a pale yellow or a deeper yellow more towards gold? Thank you"